​Meetings are Over for the Summer! Enjoy your summer and paint, paint, paint!!! Julia Graf’s Apps for Artists Presentation started with 2 short videos about a very talented digital artist named David Hockney and his art. The first video showed some very basic drawings such as a glass with flowers, a sunrise and portraits. They were rough sketches that clearly captured the essence of the subject. The second video was about an exhibition in London’s National Gallery, of Mr. Hockney’s very large, very detailed, digital artwork that was created on his iPhone. It’s amazing what is possible with just an app. After the videos Julia opened each art app that she has and showed us the basics of how they work. We were able to follow along and take notes on the handout she provided. Each app has a different way to control the pallet, brushes and layers. There is a lot of overlap of features between the apps so she recommended that you find the one that works best with the way you work and think. Several of the apps have features that help artists in other mediums, like the GridPainter and Notanizer that are already being used by several members. Julia’s presentation was very interesting and everyone seemed to enjoy learning about this different way to make art and a digital way to help us with our own art no matter what the medium. To get a copy of the handout …. Click Here. outstanding, beautiful paintings. It was very difficult to select the winners from so much talent. the act of creation offers relaxation, builds self confidence and improves emotional development. We are pleased to partner with Owl and Panther whose mission statement reflects its commitment to refugee families impacted by torture and trauma prior to arriving in Tucson. Owl and Panther works "to help provide refugee children and their families with healing experiences and a welcoming community." Click on the Activities Tab for the complete Tucson Pastel Society Calendar. We are meeting for Open Studio Costume/Figure on the 1nd Wednesday morning each month from 9:00 am - 12:00 noon and Open Studio Still Life on each 1st Wednesday afternoon from 1:00 - 4:00 pm at 2447 N. Los Altos in our new TPS building. Open to the public and $10 for the day. All mediums are welcome. Check out the plein air page for our season schedule. Meeting times and car pool instructions are listed. Click on the Shows tab to see all of our show information. Please support the renovation of our building by selling tickets for the Millions for Tucson Raffle sponsored by the Click Foundation. 100% of monies collected goes to our renovation fund. 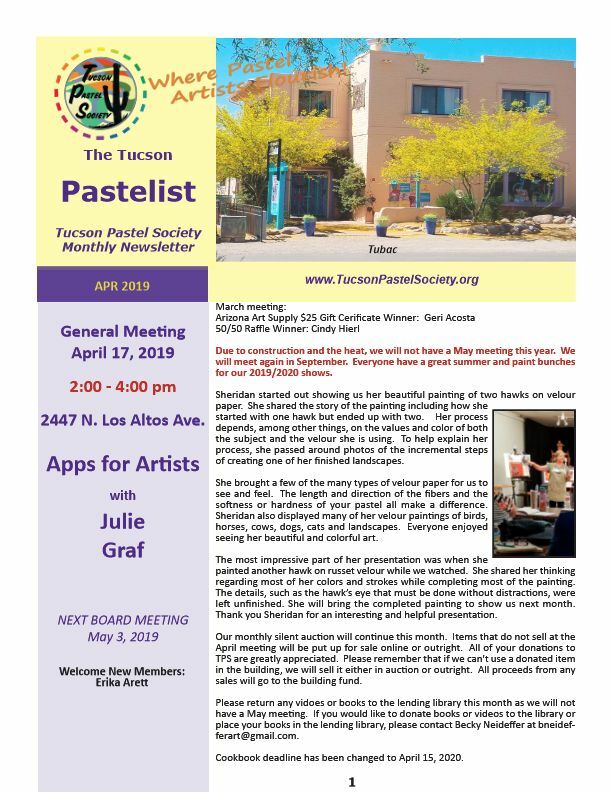 A monthly newsletter with updates on the members of Tucson Pastel Society and so much more! Download the past & current newsletters from this year. Don’t have it? Click here to get it. Visit our facility page for rental information, contracts and payment possibilities. ​Also visit the Facility Event page where events not sponsored by TPS will be listed. If you would like to participate in any of the unsponsored events, contact the person listed for fees and information.